Just so you know, last night was like basketball nirvana for me. First, the Sixers knocked off the no. 1 seed Bulls, giving my beloved Celtics the possibility of having home-court in Round 2. Then, the banged-up Celtics squeezed out an emotional Game 6 win at home and vanquished Atlanta, propelling them into the second round. 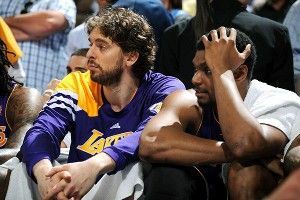 And then, to cap things off, the Lakers self-destructed in Denver — highlighted by Bynum sulking on the bench!!! — and have to play Game 7 against the surging Nuggets. I loved last night and I want to relive it again and again and again. But since that was impossible, I brought on one of the guys who called Game 6 for TNT in Denver — our friend Steve Kerr — to talk about Round One, as well as the playoff picture, great point guards, Clippers-Grizzlies, JaVale McGee, Greg Oden and even his recent Grantland column about the one and done rule.